The world’s biggest automotive aftermarket show certainly did not disappoint. SEMA—short for the Specialty Equipment Market Association trade show—was held in Las Vegas from October 30 to November 2, and was home to over 2400 exhibitors who showed off new products to more than 160,000 industry insiders from over 140 countries. And who wouldn’t want to attend? From a 246kW, 1968 Dodge Charger to a Tesla-juiced classic Mercury Coupe to a stretched Polaris Slingshot big enough for an NBA legend and three of his buddies, SEMA is always packed full of surprises. Here are just a few of this year’s headliners. The 1968 Dodge "Super Charger Concept" with Mopar's Hellephant crate motor. A total of 746kW. In a box. Delivered to your front door. That’s what you get when you order the brand new 7.0-litre “Hellephant” crate motor from Fiat-Chrysler’s Mopar division to slot into your Dodge project car. 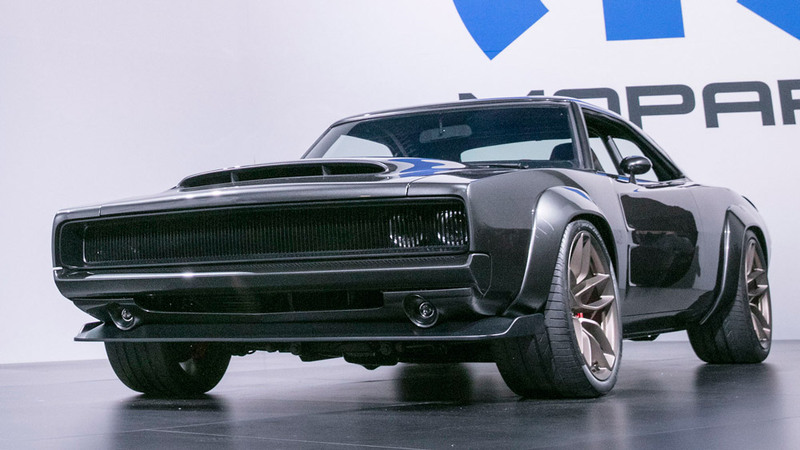 At SEMA, Mopar showcased the mighty supercharged V8—and all of its 91290Nm torque —squeezed under the bonnet of a gorgeous, fully restored 1968 Charger, badged (rather unimaginatively) “Super Charger Concept”. We were thinking more on the lines of “Demon Dumbo”. The first Hellephants get delivered in early 2019. Price is expected to be upwards of $27,500. The 2019 GT Carbon Series comes with exposed carbon-fibre bodywork and a weight savings of around 18kg. Soon there’ll be more choices of Ford GT than cooked meats at the supermarket deli. 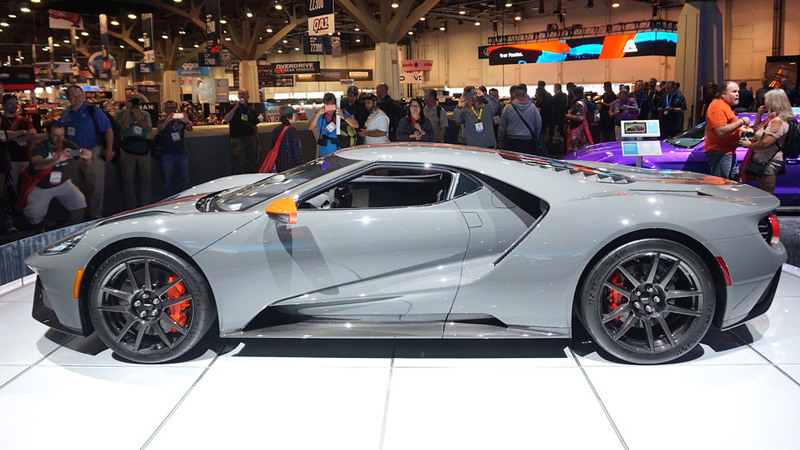 Unveiled at SEMA last week was the latest: the 2019 GT Carbon Series. Based on the stripped-out Competition Series GT, it comes with exposed carbon-fibre bodywork, carbon wheels, and a polycarbonate engine cover. Throw in a titanium exhaust and titanium wheel-nuts, and the weight savings is around 18kg—important when you’re carving curves on a racing circuit. Lucky buyers also get to pick from four accent colors for the centre stripe, mirrors, and brake calipers—orange, silver, red or blue. 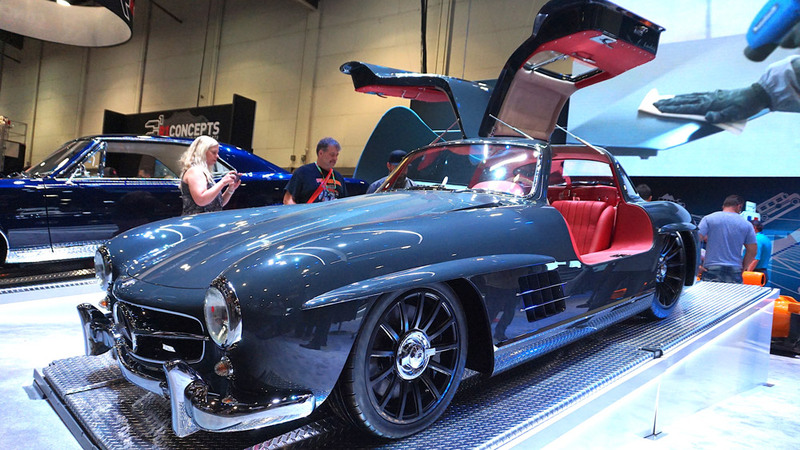 This Gullwing restomod features a 477kW GM LSX 454 crate motor. These days, an original 1955 Mercedes-Benz 300SL Gullwing will set you back $2 million and up. That was too steep for Bay Area enthusiast Rich Buckley. So, two years ago, he found a badly-finished, made-in-Florida, fibreglass Gullwing replica, and handed it over to Dave Kindig’s Kindig-It Design workshop in Salt Lake City, Utah. The result is this spectacular Gullwing restomod. Rebuilt from nose to tail, it features a GM LSX 454 (7.4-litre) crate motor cranking out over 477kW, custom EVOD wheels with knock-off spinners, Wilwood brakes, a Borla exhaust, and a spectacular red leather interior. Buckley’s contribution? He tracked down an original, and very pricey, aluminium 300SL hood. Ryan Hoegner says the squirrel-infested 1982 Porsche 911 SC coupe he found in a Louisiana barn 18 months ago went from “my little project” to “let’s redo everything”. 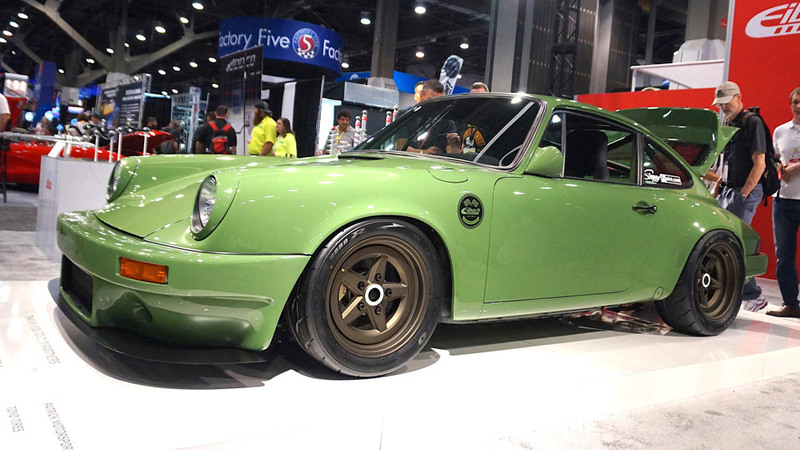 The result is this olive green restomod 911 that debuted on the Eibach USA stand at SEMA. (Hoegner is Eibach’s business development manager.) While 85 percent of the car’s original parts were restored by Sleepers Speed Shop, based in Costa Mesa, Calif., Hoegner had the 911’s factory torsion bar suspension replaced with a full Eibach adjustable coil-over and sway-bar set-up. The original 3.0-litre motor was rebuilt and now produces 200kW. True Porsche perfection. 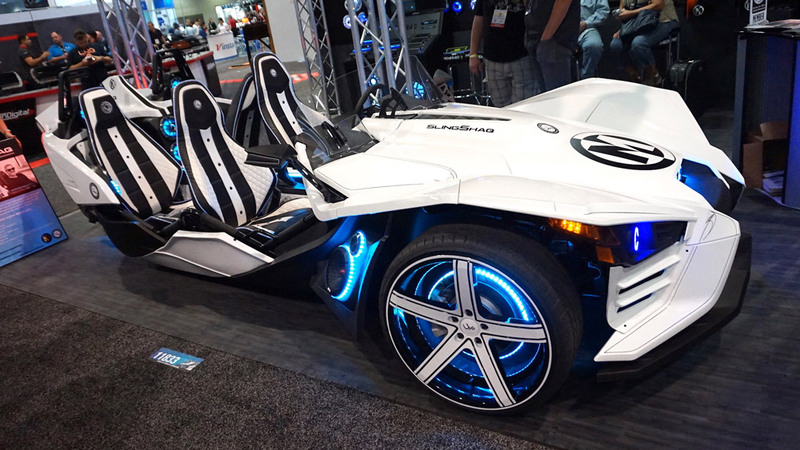 Shaquille O'Neal's heavily modified Polaris Slingshot. NBA legend Shaquille O’Neal loves the three-wheeled Polaris Slingshot. At SEMA, he revealed his latest creation, the stretched four-seat SlingShaq he just had built by Florida-based Underground Autostyling, Inc. It comes crammed with the very latest custom Memphis Audio equipment, including an 18-speaker sound system with 10-inch and 12-inch subwoofers and a 28-inch overhead sound bar with four 6.5-inch speakers. It also features wild, ice-blue LED lighting for the wheels, headlights, and speaker surrounds. It also sports white, diamond-quilted leather for the cabin. A Honda Ridgeline meets Pioneer 1000 side-by-side. Honda has got the “play-in-the-dirt” sector of the market pretty well covered, with its Ridgeline pickup truck and climb-any-mountain Pioneer 1000 side-by-side ute. But for SEMA, the marque answered the question: What would happen if you combined the two? The result is the Honda Rugged Open Air Vehicle concept—ROAV. 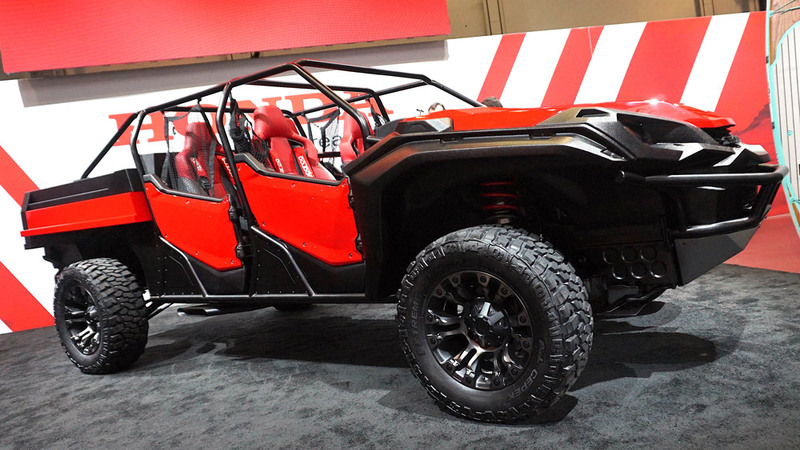 It’s essentially an overgrown, oversized four-seat Pioneer 1000 dune buggy. Honda engineers stripped the bodywork from the Ridgeline, keeping the floorplan, power train, and suspension, while bolting a set of Pioneer doors to a tubular steel roll-cage. Alas, there are no plans for production. To the untrained eye, the rust-encrusted body wouldn’t prompt a second glance in a junkyard scrap heap. Yet under the bonnet of this 1949 Mercury two-door coupe sits a state-of-the-art electric power train. It’s the work of Los Angeles–based ICON and its co-founder and lead designer Jonathan Ward. With the help of Stealth EV, ICON created the configuration to look like a V8 with its two controllers straddling an 85 kWh Tesla battery pack. Output is said to be 300kW and 637Nm torque—enough for up to a 320km range and 195km/h top speed. You can even charge it at a Tesla Supercharger station. Chip Foose completed the car just two days before SEMA. You need a great paint job if you’re taking pride of place on the SEMA booth of automotive paint giant BASF. 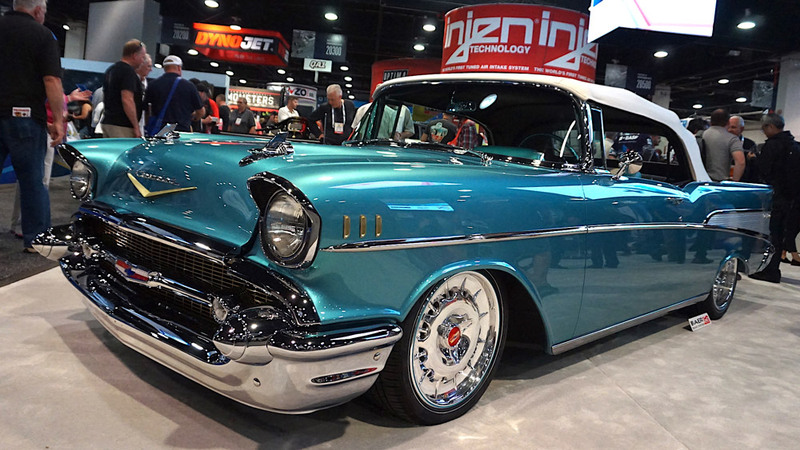 Which is why you can see your reflection in the mile-deep aquamarine finish of Chip Foose’s 1957 Chevy Bel-Air Convertible he completed just in time for the show. Built for Mike Malone, well-known car collector and retired founder and CEO of AEI/DMX Music, the LS-powered Chevy was still being finished-off two days before the exhibition opened. “I call it the ‘SEMA Thrash,’ where everyone is working 24 hours a day to get things done,’” says Foose.